This idea was submitted by my friend Jon. It involves mounting a weed eater attachment to the front of your lawnmower. So when you are mowing in an area in need of trimming and edging you just have to flip a switch and your mower does it for you, eliminating the need to pull out your weed eater and make another trip through the yard. 3 Comments on "Lawn Mower Weed Whacker Combo"
I had the same idea, except I had the weed eater on the side of the mower and it had a rubber guard that opened like one of those change holders. 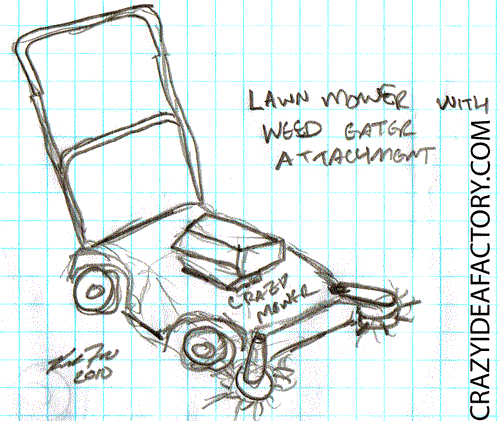 The website that I entered is the one that I found this posted in/ I do not have a website…anyways, I think your friend, Jon has an awesome idea of the mower/weed whacker! It is so much safer with the whacker being in front of the machine as opposed to along the sides as people do have a tendency to walk up to you while you are mowing without you knowing that they are doing so! It would be great to be able to: Mow the lawn, weed whack, and catch the cuttings in a mower bag…saving more time to be able to spend on something else that you’d enjoy besides a beautiful yard! I think it’s awesome! Hope to be able to see that dream come to reality one day soon! Also, it’ll be great for older folks that can’t do a lot of that work themselves! Good luck, Jon!